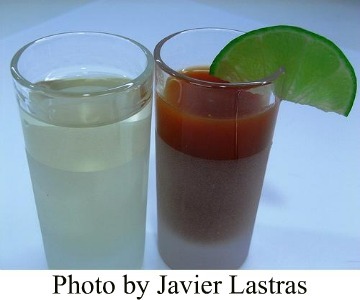 A Sangrita (Spanish for “little blood”) is a traditional Mexican drink best served cold. A unique mix of spices and juices, it's are often used as a chaser when shooting tequila. 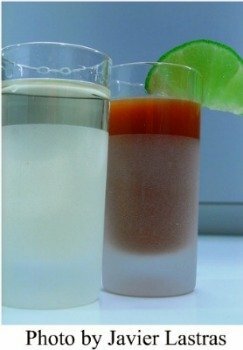 It can also be mixed with grapefruit soda, other citrus juices and tequila to make a vampiro cocktail (Spanish for “vampire”... and yes, you already guessed the color of the drink). "Little blood" can be made with many ingredients, but it usually includes orange juice, lime, tomato juice, onions, salt, and chili powder. Other recipes add pomegranate juice and hot sauce.Note: do not confuse it with sangría or a Bloody Mary. Sangria uses wine, fruits, and soda; a Bloody Mary uses vodka. Oh, and expect me use the term "little blood" often: it's too awesome not too. Makes: 1 very awesome spicy mix. Mix all the ingredients. Add Tabasco sauce, Worcester sauce, lime juice, salt, and pepper as desired. Feels like too much improvisation? Don’t worry. Simply taste and add using your own judgment. You’ll find it’s easy to play around with it. There you go, a fantastic mix... and homemade too! Careful though, you may grow addicted to this recipe. Ready to take this recipe to the next level? How about making a Vampiro? Pretty straightforward. Salt the rim of the glass, pour the tequila in the Collins glass, add some ice, and fill the rest with "little blood". Voila! A sweet and addictive Mexican Vampiro! Whether you’re using it to sip, chase, or mix with tequila, sangrita will pump any party up! Just pour a few liters in a jar, place a tequila bottle next to it, and watch it magically disappear.